In 1941, UNCG’s Gregory Ivy established a university teaching art gallery based on the belief that students should be exposed to the art of their time – the art that speaks to the issues of the day. 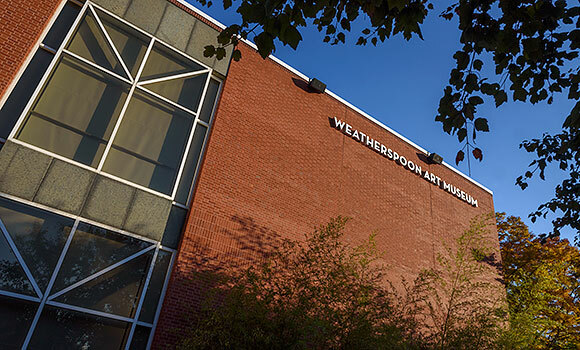 Seventy-five years later, UNCG’s Weatherspoon Art Museum has transformed into a fully professional museum serving more than 37,000 visitors and 24,000 students annually. Yet the mission remains the same: inspire through modern and contemporary art. The Weatherspoon’s 75th anniversary celebration, which kicked off in January with a “First Toast,” continues this Saturday, Oct. 1, with its two signature events: the 75th Anniversary Gala and WAM JAM, the gala’s after-party. Saturday also marks the first showing of the museum’s anniversary exhibition, “Decade by Decade: Art Acquired in Its Time.” The exhibition includes work from a variety of notable artists, including Alexander Calder, Lee Lozano and Eva Hesse. “The Kindness of Friends: Gifts in Honor of the 75th Anniversary,” a new exhibition that showcases a collection of art that has been gifted to the Weatherspoon in honor of the anniversary, will also open to Gala and WAM JAM attendees on Saturday night. This unique exhibition will open to the public on Sunday, and “Decade by Decade: Art Acquired in Its Time” will open to the public on Tuesday, Oct. 4. Reflecting on the history of the Weatherspoon, one moment in particular stands out to Doll: the acquisition of Willem de Kooning’s “Woman,” the jewel in the museum’s permanent collection crown and a fundamental piece of the Abstract Expressionism movement. “It was such an avant-garde purchase of the time,” Doll said. Doll also recognizes the Weatherspoon’s move into its current home, the Anne and Benjamin Cone Building, in 1989 as a big step in the history of the museum. However, Doll looks forward to making changes to the space as the museum continues to grow. According to Doll, the museum’s success stems from its accessibility – including free admission and free parking – and its quality exhibitions that appeal to a wide audience. Doll and her team are focused on consistently bringing in new work that is exciting and approaches different issues and subject matters. The long-term goal? For Doll, it’s all about touching lives. A limited number of Gala and WAM JAM tickets are still available for purchase. For more information and to purchase tickets, visit weatherspoon.uncg.edu.